Ten to 12 civilians, mostly children and women, were reported killed following alleged airstrikes on Khishham, 15 km southeast of Deir Ezzor. The majority of sources accused Russian warplanes of committing the offence. However both the Regime and the US-led Coalition were also mentioned in reporting. Syrian Press Center reported that Russian warplanes used “cluster bombs around the house of Aref al-Humaidi”. According to local reports a number of houses were destroyed. Qasioun said “A squadron of Russian fighters also shelled the villages and towns of Deir al-Zour in the east with dozens of airstrikes loaded with cluster bombs, the latest of which was in the village of Khasham”. A number of sources, including Deirezzor and @ahraralmyadein, referred to “warplanes” but did not specify a culprit. Fresh-syria blamed both the Regime and Russia, whilst Jbc was the only source that referred to the Coalition – Jbc pointed out that the Coalition and Russia were both “committing massacres” in Deir Ezzor countryside – neither were blamed for the Khisham incident specifically. 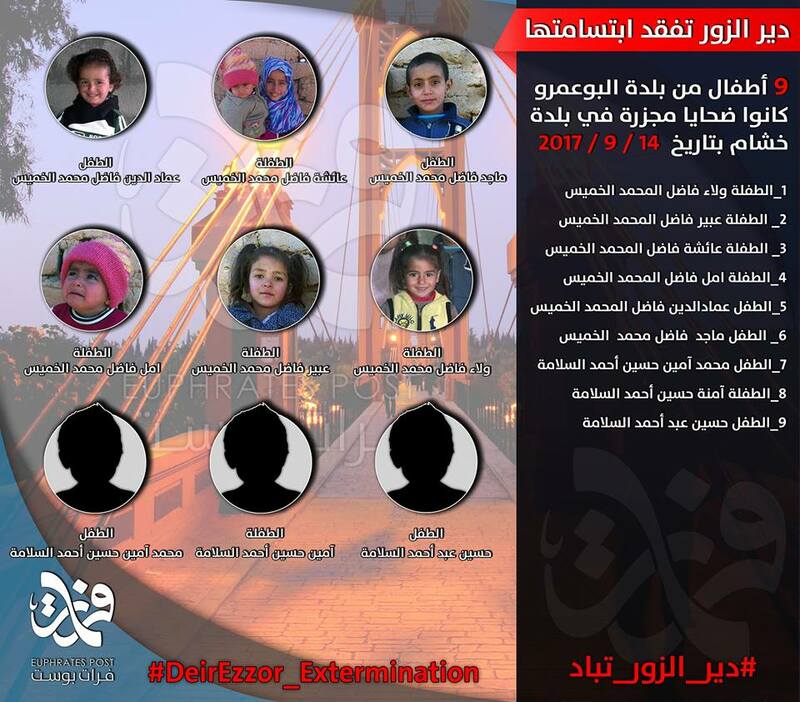 According to Euphrates Post the nine children (pictured) were all from the town of Buammaru when they were killed in Khasham, the Euphrates Post alleged Moscow responsible.